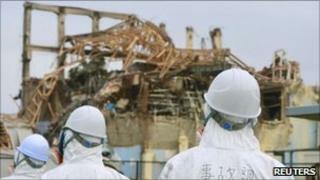 A radioactive gas has been detected at Japan's crippled Fukushima nuclear plant, the facility's operator says. Tepco said xenon had been found in reactor two, which was previously thought to be near a stable shutdown. There has been no increase in temperature or pressure, but the discovery may indicate a problem with the reactor. Boric acid - used to suppress nuclear reactions - has been injected as a precaution. Ever since the meltdowns in March triggered by the huge earthquake and tsunami, engineers have been working to bring the Fukushima reactors under control. The government and Tepco - the Tokyo Electric Power Company - have said they are on track to achieve a stable shutdown by the end of the year. But now they have found what could be a problem - radioactive xenon gas detected in a filter in reactor two. Since it has a short half-life, it indicates a possibility of resumed nuclear fission in recent days. Tepco says the temperature of the reactor, which has been below boiling point, has not increased, indicating any reaction would be small. It is not ruling out a false reading but boric acid, which suppresses fission, was injected into the reactor overnight. Meanwhile, elsewhere in Japan a reactor has been switched on for the first time since the disaster. Safety fears mean local authorities have been refusing permission for restarts after routine maintenance. Dozens of facilities are offline amid concern about electricity shortages.